We partnered with PersistIQ to talk about 5 ways you can improve your sales prospecting in 2019. 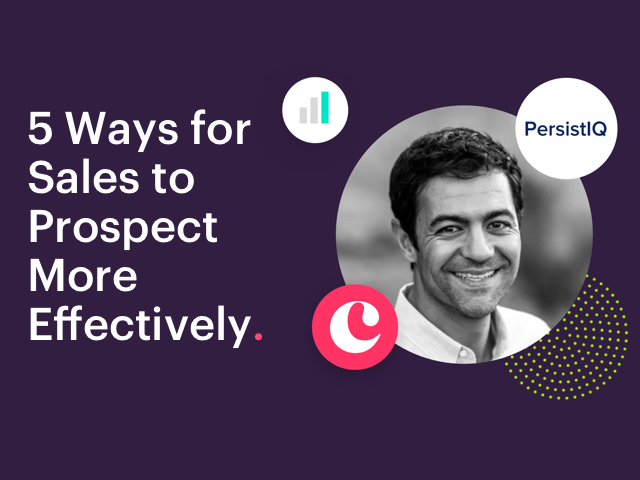 Joining us on this webinar is Pouyan Salehi, the CEO and Co-founder of PersistIQ to share the most effective ways to prospect better. Find out how your sales teams can prospect better and close more deals! We're not using our CRM to its full potential. Contact management is just the beginning of what your CRM should be doing for you—and if you’re only using it as a database, you’re probably wasting money every month on tools you don’t need. We'll be talking about things you didn't know your CRM could do in this webinar. -Sign up for the on-demand webinar to learn about all the little-known CRM hacks that can save you $$$. Join our to learn the 7 habits you need to instill in your reps to build a successful sales engine, that drives results every month. During this webinar, you will hear from Jesse Price, Director of Sales at Copper, and his journey as a sales rep at IBM to account executive at Salesforce to now leading Sales at Copper. He will share tangible best practices on how to make every rep a top performer to ensure they hit quota. Watch the on demand webinar today and see how your business stacks up! As intimidating as cold calling can be, it’s a powerful sales tool with predictable and measurable results. And if hang-ups are the rule rather than the exception for you, we’ve got some tips to help you out. "When you’re looking for new potential clients, there should only be one goal in mind: moving these prospects through the sales funnel until they eventually convert into revenue-generating customers. But how do you ensure you’re maximizing your sales prospecting efforts? We recently teamed up with our friends at Reply.io to share 4 Tips for Better Sales Prospecting." Relationships are hard, even when it comes to B2B sales for subscription businesses. But as challenging as it may be, it’s not impossible, even with sales evolving more and more into relationship management. A question to all sales leaders out there: have you ever had great months or terrible months in sales but not really known why or how? Of course, you have. It was a facetious question. But not to worry, you’re in good company. ProsperWorks Director of Sales Training, Kyle Bastien, and VP of Sales, Jake Young, at Grow.com teamed up to share the tough questions they’ve had to ask themselves throughout their careers and discuss and debate the best way to get the answers. Join our webinar to get the real sales metrics and equations they use to find the answers to some key questions around where failure points are in sales and what behaviours are really important to growing your sales team. Cold emailing prospects can be tricky – recipients most likely don’t know who you are, and therefore, won’t give you the time you deserve. That’s why you need great content to break the ice. So, how do you get through to your leads in a personalized and time effective way? Wouldn’t your sales team be so much more efficient if your CRM and sales engagement tools worked seamlessly together? Well, now they do. PersistIQ sales prospecting automation and ProsperWorks CRM have joined forces to make selling easier. PersistIQ now integrates with ProsperWorks so you can automate prospecting and be more effective at driving opportunities forward. More time selling means more customers in the door. For companies everywhere, automation is moving the needle of business efficiency. Organizations that embrace business process automation have cut costs, saved time, and simply improved team morale. Want to learn how you can make your team more productive with document automation? We recently teamed up with WebMerge to explain how. “Sales process” may be one of the most overused terms by businesses today. However, it’s essential to have a clear understanding of yours in order for it to be profitable. Join us for a discussion hosted by Gene Marks, where panelists from ProsperWorks and The Marks Group share their knowledge on how you can turn your sales process into a money-making machine. "As we've mentioned before, ProsperWorks is Google’s only recommended CRM for a reason. Along with being super easy to use, we’re highly customizable, visual, and fit seamlessly into the workflows of G Suite users. But how does this integration really help teams like yours? " Feeling the heat to keep your sales team fighting through the summer months? We know the feeling. From people on vacation to general software usage drops in Q3, there are a lot of things to go up against in June, July and August. Here are a few tips from ProsperWorks Sales Manager, Brittany Perez, on how to fight the seasonality slump, and what you can do to prepare your team. You have one shot to crush a demo with a potential customer. It takes a lot of practice to quickly understand a prospect’s pain points and cater your message to craft the perfect pitch. So how do you get it done? ProsperWorks Senior Sales Trainer, Kyle Bastien, shares the best practices that make up his winning demo formula. So, what are some of the ways that ProsperWorks and G Suite has helped UrbanVolt as they’ve completed over 100 installations? Find out in the webinar. Everyone knows data is one of the most important assets of a company. But keeping that information clean and maintaining a high-quality database is another story. The data you have about your customers is a key factor in Customer Service, Marketing, Sales, etc. That’s why we teamed up with PieSync to better highlight the importance of data integrity. Copper is the only crm made for G Suite. Copper is the crm that works for you. Copper is the leading crm for G Suite and recommended by Google. It works instantly through a seamless integration with G Suite, has a beautiful user experience, and is designed to help teams and businesses build long-lasting relationships. Copper services more than 12,000 paid businesses in more than 110 countries. Headquartered in San Francisco with over 200 employees, the company has raised $87M in venture capital financing to date. For more information or to sign up for a free trial, visit www.copper.com.